SAN FRANCISCO — For the first time in the United States, visitors can view paintings by the acclaimed Japanese painter Tetsuya Ishida, in an intimate museum exhibition at San Francisco’s Asian Art Museum. “Tetsuya Ishida: Saving the World with a Brushstroke” is on view in the museum’s Tateuchi Gallery through Feb. 22, 2015. “On Holiday,” approx. 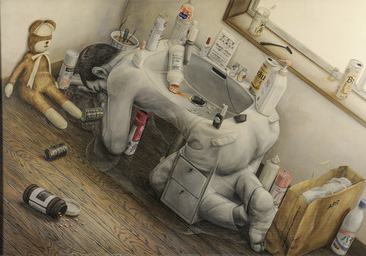 1999, by Tetsuya Ishida (1973–2005). Acrylic on canvas. Courtesy of private collection. © Estate of Tetsuya Ishida. The life of Ishida, who was born in 1973, spanned a period of rapid social change in Japan: the soaring rise of its “bubble economy” in the 1980s; its crash from 1990 to 1991; and a time when such grim events as the sarin gas incident of 1995 unsettled the nation. 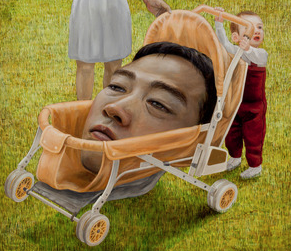 Ishida’s paintings offer a unique approach to the tensions of his generation, which came of age amid rising social and academic expectations and uncertain future prospects. In 2005, Ishida’s death at age 31 ended a brief but significant career as a painter. While touches of bleak humor temper his work, Ishida’s darkly powerful imagery poses universal questions about the nature of identity and the meaning of life in the modern, post-industrial world. The eight paintings shown in “Saving the World with a Brushstroke” cross the spectrum of the artist’s major themes: workplace and academic pressures, the search for identity, and social dislocation. Ishida’s paintings combine fantasy and hyper-realistic detail to often surreal effect. Home, office, parks and city streets are invaded by mysterious intrusions of bodies, tree limbs and urban debris. A face with short hair, seemingly a self-portrait, appears in most of the paintings, attached to a young man’s body, or sometimes fused with machines and inanimate objects. Unnatural and unnerving, these strange juxtapositions evoke strong reactions from many viewers. Whether Ishida believed his own works offer any salvation is left for each viewer to consider. But whether by means of humor or pain, they unequivocally force us to confront — and perhaps empathize with — his vulnerable, solitary subjects. Untitled, 2001, by Tetsuya Ishida (1973–2005). Acrylic on canvas. Courtesy of private collection. © Estate of Tetsuya Ishida. Foto by cal KOWAL. Organized by the Asian Art Museum, “Tetsuya Ishida: Saving the World with a Brushstroke” is curated by Dr. Laura Allen, curator of Japanese art, and Dr. Yuki Morishima, assistant curator of Japanese art. This is the only venue for the exhibition. The Asian Art Museum–Chong-Moon Lee Center for Asian Art and Culture is one of San Francisco’s premier arts institutions and home to a world-renowned collection of more than 18,000 Asian art treasures spanning 6,000 years of history. Through rich art experiences, centered on historic and contemporary artworks, the museum unlocks the past for visitors, bringing it to life while serving as a catalyst for new art, new creativity and new thinking. Hours: Tuesdays through Sundays from 10 a.m. to 5 p.m., with extended evening hours on Thursdays during the spring and summer. Closed Mondays, as well as New Year’s Day, Thanksgiving Day and Christmas Day. Admission: Free for museum members, children under 12, and San Francisco Unified School District students with ID; $15 for adults; $10 for seniors (65+), college students with ID, and youths (13–17). Admission on Thursdays after 5 p.m. is $5 for all visitors (except those under 12, SFUSD students, and museum members, who are always admitted free). Admission is free to all on Target First Free Sundays (the first Sunday of every month). A surcharge may apply for admission to special exhibitions. Access: The museum is wheelchair-accessible. For more information regarding access, call (415) 581-3598 or TDD: (415) 861-2035.